Credit: By Dion Hinchcliffe on Flickr. Some rights reserved. 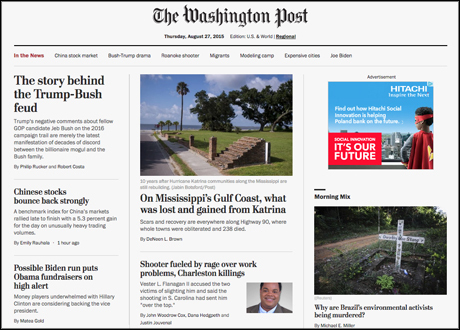 Readers who visited the Washington Post website yesterday might have noticed something different – the outlet rolled out a new homepage, with a cleaner design focused on images, larger headlines and a quicker loading time on desktop. Journalists and editors can now quickly update the "flexible" homepage, being able to change an article's headline, blurb or format and even rearrange the entire layout using an in-house publishing platform called Arc. "This is huge for the newsroom, because before you would have to go into a separate file to make a change, then save it and refresh just to see what happened," said Greg Franczyk, the Post's principal architect and director of software engineering. "Inevitably, a headline would break in the wrong way or something similar would happen and you'd lose two, three, five minutes every time with previewing." The change is the final step in the Post's website reboot process that began back in 2011, when the outlet started working on the in-house publishing tool that now powers the entire site. "We were looking at the digital landscape and we knew that we wanted to work on the user experience, both for the newsroom and for our readers," said Franczyk. His approach to building it was to embed between nine and 12 engineers in the newsroom in early 2012, who worked together with the journalists to develop the tools they needed. "We have 700 people in the newsroom, so the viewpoints tend to be varied. "But we listened to their ideas and thought about what kind of platforms or technology we could build that would enable them to do the things they wanted to do." Most requirements revolved around tools that would allow journalists to embed social media posts in their storytelling, publish updates as quickly as possible and make the production process more efficient. This is why one of Arc's main features is Pagebuilder, a module developed in 2013 that allows any member of the newsroom to quickly create new pages on the website and edit existing ones, such as the homepage. Arc also allows journalists to work simultaneously on the same story or even the homepage, as changes made by individuals are saved on a local server to avoid clashes. The changes are then merged into a shared copy that everyone can access before publishing the final version, which could be useful when dealing with breaking news, as the turnaround of a story is quicker. 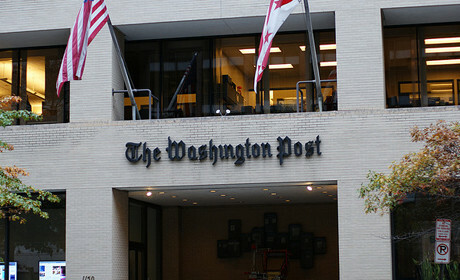 The Post uses WordPress for 70 per cent of the content it produces – Arc integrates through APIs with WordPress and other platforms, such as the Washington Post recipe or quiz database. Franczyk explained that the team first began experimenting with Pagebuilder on individual article pages back in 2014, because "they take 90 per cent of our traffic and didn't require a lot of production", but also because it was a good base for improving the tool in the future. He said the Post's approach is not launching a large number of features quickly, but testing and improving those that work well or completely scrap flawed concepts. "If you're going to be quicker, agile and innovative, you can't be in a place where it takes you six months to build something. So this platform allows us to build things in days, not months and it's just the first step in a much larger vision that we have for the site."